By the way, why Happy Smiles? As I understand the initial title was Waste Management. Yulia: Many journalists always said “Girls, why are your albums called Lyudi Invalidy, Waste Management – always depressive?” So we made it ironic – if you want happy, here you have Happy Smiles. When you open the box you see letters WM, i.e. Waste Management. Guys, here’s the design of the t-shirts we saw on the girls yesterday, for those who haven’t find their nicknames. The idea was very sudden, and there was no enough time for objectivity, so no offense to those, who haven’t find himself, the list will be updated, and the t-shirts will be available at the TATU-SHOP, and will be in much better quality. 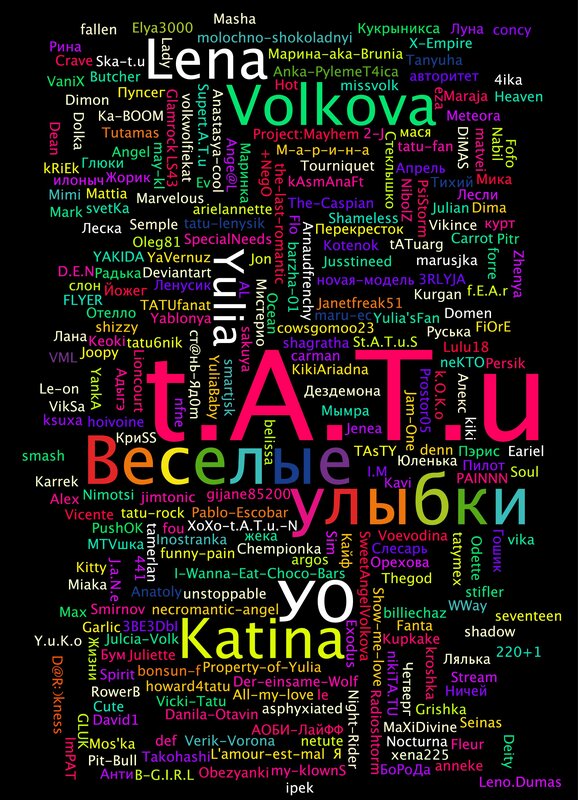 AllMyLove.org would like to thank t.A.T.u.’s management for including our forum name “all-my-love” on the list, and most importantly, t.A.T.u. for wearing the t-shirt! Congratulations to all of the other forum members who were included! New album released on Tuesday – it’s official! t.A.T.u.’s third studio album “Happy Smiles” will be released October 21 (Tuesday). The first copies of the album will be delivered to two “SOYUZ” stores situated on Pyatnitskaya St. and Leninskiy Prospect, 11. On this day we’ll be giving special posters to the first buyers of “Happy Smiles” in Lelinskiy Prospect store (the number of posters is limited)! “Happy Smiles” is now available for purchase at shop.taty.ru. Hey, it’s me! Decided to react on your call and write something. By the way, awesome poem, really liked it. And of course thank you for congratulations! I just feel so happy! At least one day in a year I hear only compliments I celebrated, as you know, absolutely quietly, with the closest people. But somehow I have so many gifts! t.A.T.u. was interviewed by “Plejada” after the 2008 Viva Comet Awards. Thanks to k.O.K.o. (tatu.ru/forum). Today Lena Katina is 24! T.h.a.n.k.y.o.u. each and everyone for your congratulations from all around the world, for sweet b-day wishes, poems, cards, drawings, videos and even special "b-day blogs", sites sections and avatar collections! This time Lena’s birthday takes place in “working atmosphere” – t.A.T.u. are undertaking promo-activities in Poland during the last days of their visit to this country. Thank you, tatu.ru for including our Lena birthday page in the latest news entry. We will always love and support you, Lena. Happy Birthday! 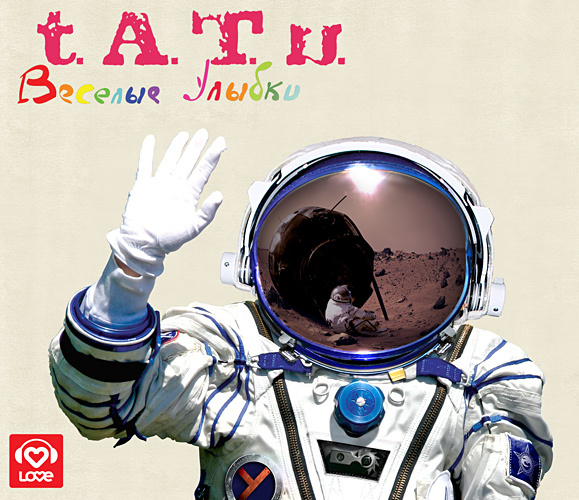 t.A.T.u. performed at the 2008 Viva Comet Awards in Poland on October 2nd, 2008. Below is the video for the performances of “White Robe” and “220.” Thanks to tatugirls.it and Fanta (tatu.ru).